Reading and share top 554 famous quotes and sayings about Theatre by famous authors and people. 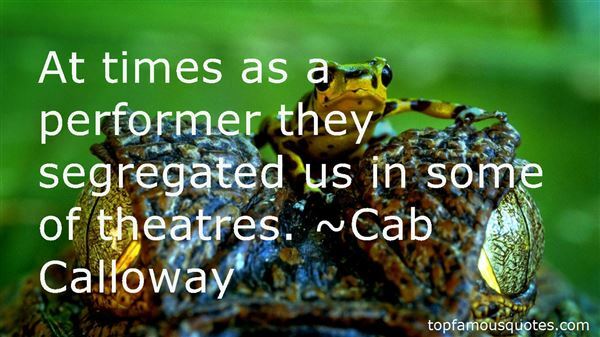 Browse top 554 famous quotes and sayings about Theatre by most favorite authors. 1. "Free speech means the right to shout 'theatre' in a crowded fire." 2. "I guess we've had a very close relationship because I don't pretend to know about cinema and I think I do know a bit about theatre but he does, he respected that and so we really just had a collaboration which went completely like this." 3. "Nadya Zelenin and her mother had returned from a performance of Eugene Onegin at the theatre. Going into her room, the girl swiftly threw off her dress and let her hair down. Then she quickly sat at the table in her petticoat and white bodice to write a letter like Tatyana's. 'I love you,' she wrote, 'but you don't love me, you don't love me! 'Having written this, she laughed.She was only sixteen and had never loved anyone yet. She knew that Gorny (an army officer) and Gruzdyov (a student) were both in love with her, but now, after the opera, she wanted to doubt their love. To be unloved and miserable: what an attractive idea! There was something beautiful, touching and romantic about A loving B when B wasn't interested in A. Onegin was attractive in not loving at all, while Tatyana was enchanting because she loved greatly. Had they loved equally and been happy they might have seemed boring. ("After The Theatre")"
4. "I feel so sorry for younger actors who aren't able to have the opportunities that I had, starting out in repertory theatre. It's really tough on young actors now." 5. "Acting must be scaled down for the screen. A drawing room is a lot smaller than a theatre auditorium." 6. "We can compare classical chess and rapid chess with theatre and cinema - some actors don't like the latter and prefer to work in the theatre." 7. "At times as a performer they segregated us in some of theatres." 8. "As for theatre, there's ups and downs to everything. Theatre is ephemeral. But that is part of its charm because you can always say the production was better than it was." 9. "I fought back the tears that came with experiencing something as perfect and powerful as the performance I'd just had. That was what theatre was about - that kind of experience. We would never be able to recreate that again. Only the people here tonight would ever know what that show was like. Theater is once in a lifetime... every time." 10. "One of my beliefs is that there are certain institutions within a community which stand for the spirit and heart of that community, there's the church, the local football team, the local pub and the theatre." 11. "I think there is no world without theatre." 12. "At the turn of the century theatre does not have to be prescriptive." 13. "In the end I think theatre has only one subject: justice." 14. "People come to the theatre to be excited and uplifted - I want to inspire my audience." 15. "Our poor human heart is flawed: it is like a cake without the frosting: the first two acts of the theatre without the climax. Even its design is marred for a small piece is missing out of the side. That is why it remains so unsatisfied: it wants life and it gets death: it wants Truth and it has to settle for an education; it craves love and gets only intermittent euphoria's with satieties. Samples, reflections and fractions are only tastes, not mouthfuls. A divine trick has been played on the human heart as if a violin teacher gave his pupil an instrument with one string missing. God kept a part of man's heart in Heaven, so that discontent would drive him back again to Him Who is Eternal Life, All-Knowing Truth and the Abiding Ecstasy of Love." 16. "Then I heard this genius teacher Stella Adler - I recommend you read anything you might find about her and if you have anyone interested in theatre, you get them one of her books." 17. "The theatre is a tragic place, full of endings and partings and heartbreak. You dedicate yourself passionately to something, to a project, to people, to a family, you think of nothing else for weeks and months, then suddenly it's over, it's perpetual destruction, perpetual divorce, perpetual adieu. It's like éternel retour, it's a koan. It's like falling in love and being smashed over and over again. ''You do, then fall in love. ''Only with fictions, I love players, but actors are so ephemeral. And then there's waiting for the perfect part, and being offered it the day after you've committed yourself to something utterly rotten. The remorse, and the envy and the jealousy. An old actor told me if I wanted to stay in the trade I had better kill off envy and jealousy at the start." 18. "But theatre is always a difficult experience." 19. "Firstly I did it in this huge theatre in Avignon, then to smaller places, then bigger places. You have to change the volume of the voice, give more or less. The way you have to relate to space makes it like sculpture." 20. "In Coetzee's eyes, we human beings will never abandon politics because politics is too convenient and too attractive as a theatre in which to give play to our baser emotions." 21. "I've gotten to go wonderful places, meet interesting and intelligent people, and I started of course in the theatre and continue to work in the theatre where there is some intelligence involved in it." 22. "I was very interested in theatre, mostly in stage design. I did a little bit of acting." 23. "Gods? Don't let that impress you. Anyone can be a god if they have enough worshippers. You don't even have to have powers anymore. In my time I've seen theatre gods, gladiator gods, even storyteller gods - you people see gods everywhere. Gives you an excuse for not thinking for yourselves.God is just a word. Like Fury. like demon, Just words people use for things they don't understand. Reverse it and you get dog. It's just as appropriate." 24. "Many things shaped my identity as a young boy: a strong selfworth (something that was instilled in all three Barrowman siblings by our parents), my immersion in theatre and music, and my DNA. I was born gay. It's not a choice I – or anyone else who is gay – made. If it were, why on earth would anyone choose to be part of a minority, part of a group that in so many cultures and countries, even in the twenty-first century, is regularly blasphemed, hounded and worse?" 25. "Sport, as I have discovered, fosters international hostility and leads the audience, no doubt from boredom, to assault and do grievous bodily harm while watching it. The fact that audiences at the National Theatre rarely break bottles over one another's heads, and that Opera fans seldom knee one another in the groin during the long intervals at Covent Garden, convinces me that theatre is safer than sport." 26. "I got into theatre very early, so yes I was surrounded by gay people quite early and frequently." 27. "By death the moon was gathered in Long ago, ah long ago;Yet still the silver corpse must spinAnd with another's light must glow.Her frozen mountains must forgetTheir primal hot volcanic breath,Doomed to revolve for ages yet,Void amphitheatres of death.And all about the cosmic sky,The black that lies beyond our blue,Dead stars innumerable lie,And stars of red and angry hueNot dead but doomed to die." 28. "I hold theatre acting in such high esteem that it scares me." 29. "I think I want to pursue a movie career and maybe even pursue some theatre." 30. "The fog turned a strange yellow, then orange, then black. The gilded winged statue Victory at Buckingham Palace retreated into mist. St. Paul's was a hazy outline, ghostlike in the gloom. La Traviata at the Sadler's Wells theatre was terminated midway because the audience could no longer see the singers on stage. Pedestrians noticed how everything below the waist disappeared. Knees, shoes, dogs became indistinguishable. The Great Smog was days and nights of people and things passing out of sight and existence. It seemed a fitting time for a mother to evaporate." 31. "I had a fascination with 3D that goes back to the View-Master. I'd always dreamed of making a film in 3D. It's like a combination of theatre and film. There's something 3D gives to a movie that takes you to another land. Working with RealD creatively was a liberating experience. 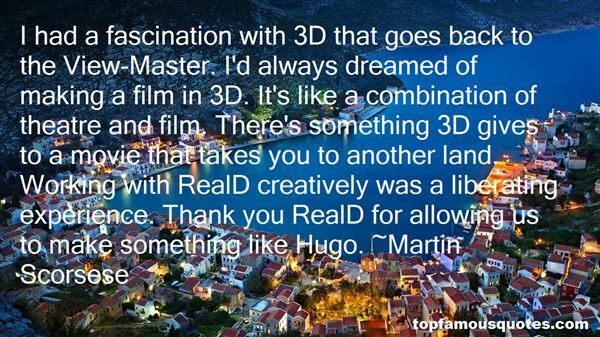 Thank you RealD for allowing us to make something like Hugo." 32. "Because Chicago was to radio what Hollywood was to films and Broadway was to the theatre: it was the hub of radio." 33. "I don't sweat the Internet. You know, it's still something I enjoy as a movie geek myself to get on and, like, look at all the websites; however, when it comes to marketing a movie, the Internet is still not the thing that gets people to the theatre." 34. "I am a theatre actor, but the last ten years I've taken parts in movies because it keeps me in money." 35. "I have such a passion for theatre." 36. "My family were broadminded enough to support me when I wanted to pursue a life in the theatre." 37. "Doing 'EastEnders' wasn't exactly suffering, but my soul's not in quick-fix TV. Theatre doesn't pay like TV work pays, though. We all have to live, don't we?" 38. "In my opinion, Christian Dior was never, ever theatre." 39. "For the theatre one needs long arms; it is better to have them too long than too short. An artiste with short arms can never, never make a fine gesture." 40. 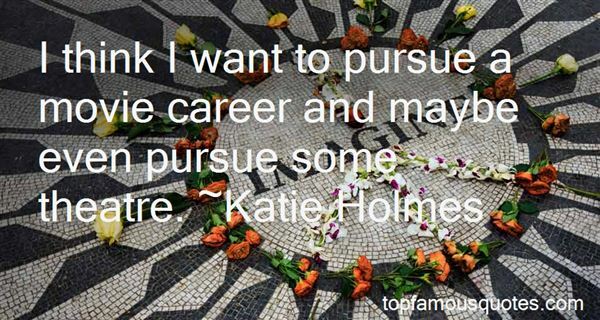 "I came to write after several mini careers. I did live theatre, managed a cosmetics store and was a local television personality." 41. "I used to love stage above all, but that was when I was a single man. As I get older, the time commitment gets harder for theatre." 42. "We must limit the running to and fro which most men practise, rambling about houses, theatres, and marketplaces. They mind other men's business, and always seem as though they themselves had something to do. If you ask one of them as he comes out of his own door, "Whither are you going?" he will answer, "By Hercules, I do not know: but I shall see some people and do something." They wander purposelessly seeking for something to do, and do, not what they have made up their minds to do, but what has casually fallen in their way. They move uselessly and without any plan, just like ants crawling over bushes, which creep up to the top and then down to the bottom again without gaining anything. Many men spend their lives in exactly the same fashion, which one may call a state of restless indolence." 43. "Opera is the original marriage of words and music, and there's a theatre element, a dramatic element. It's right up my alley." 44. "Every now and then I have to teach directing. The thing about the theatre is that the most important thing you can do as a director is to make sure that everybody is in the same world - you have to create the world and make sure everyone buys into it." 45. "My real training as an actor was when I started doing theatre." 46. "I like to use my hands. When I was in theatre in college, that was one of my biggest notes: 'You use your hands too much.'" 47. "A theatre is the most important sort of house in the world, because that's where people are shown what they could be if they wanted, and what they'd like to be if they dared to and what they really are"
48. "I remember a time when I was younger, when if you had to see an actor, you had to go to the theatre and watch a film." 49. "I come out of repertory theatre so I've been working under pressure my whole career." 50. "Totus mundus agit histrionem. (All the World's a Stage. )"[Motto of William Shakespeare's Globe Theatre (f. 1599) and its acting company, The King's Men; taken from the first play to be performed on the new stage.]" I love my children beyond all reason. They're my joy, even when they're wild with kid energy." Who Was Talking About "Theatre"?